(Newser) – A federal appeals court in Virginia thinks the US Forest Service forgot a fundamental part of its mission, and it summoned Dr. Seuss to remind them. “We trust the United States Forest Service to ‘speak for the trees, for the trees have no tongues,'" the fourth US circuit court of appeals wrote last week in a case involving a power company's request to build a natural gas pipeline. 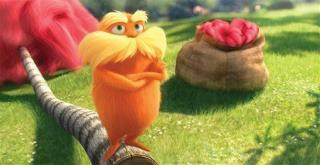 As NPR notes, the "tongues" quote is a reference to The Lorax, who at one point declares: “I am the Lorax. I speak for the trees. I speak for the trees for the trees have no tongues.” A three-judge panel from the court ruled that the Forest Service "abdicated its responsibility" in giving approval to Dominion Energy to move ahead with the pipeline. It's far from the end of the issue, however. (repost, with a change from the snoooozer nannies) The saaaaaacred trail. Interstates cross it.......many highways cross it........power lines cross it....... And they whine about ONE FOOOOKIN PIPE. See the tree The tree is tall It was always meant to fall Build the pipeline And help us all and let the liberals Scream and bawl. Cut the gas lines to all opponents of this pipeline. They need to walk the walk, perhaps a winter without heat will enlighten them.